Last minute decided to blast up to Quebec for the weekend (5 1/2 hour drive). Launched from Nord Expe and took 369, 23, 383, to 83 and landed at Ravage. Trails were all freshly groomed and phenomenal. Was mid-teens when we started Saturday morning but warmed up to mid-30's by the afternoon. Surprisingly the trails stayed hard and flat, a little bit of mashed potatoes in some areas but flat. For the amount of sleds at Mont-Apica the trails were rocket-ship fast. Light rain Saturday night but it was 14F when we left Ravage Sunday morning. Ice scratches down we blasted down the Clermont Express, floating between 70 and 95mph all the way to Clermont with music cranking in the helmet. 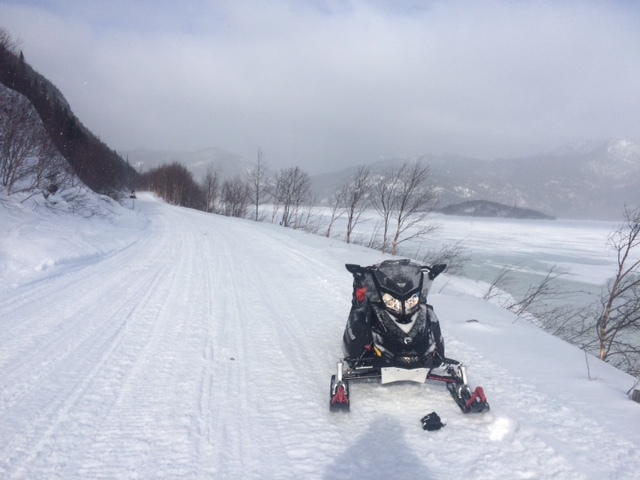 Life is good... Only sleds on the trail in the morning. TQ3 for about 15 miles South of Clermont was not groomed the night before (surprisingly because they always groom on Saturday nights, but still good) but after that it was spectacular all the way to the 304 cut-over to 369. Lots of snow still (3+ feet) but its hard to tell how long they will continue. As long as the nights stay cool to allow grooming it should be ok for another week or two. Nice run, get it while you can! We will try next week-end also. 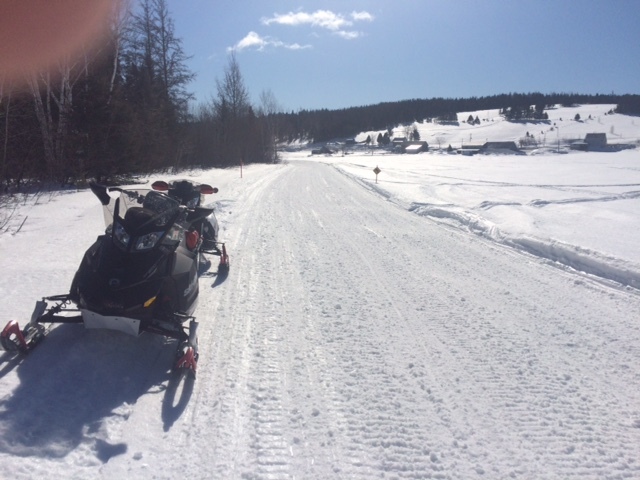 "Mashed potatoes" came to mind riding Mauricie, but that was a rainy Monday on Feb 1st! Thanks for keeping it real. Hopefully the nights stay cool like you said. Sometimes my ‎OCD out-paces my ADD and I notice stuff. It looks like the sun is shining "thru" your skis? What kind are they and what do you think about them? I'm torn between the pilot tuners that are coming with the Yammis, and the Simmons that I've run for 15+ years. Yeah I'm a bit picky when it comes to skis. I'm running Split Rail skis. They are a great ski if you want power steering and no darting. I think its one of the easiest skis to turn next to the SLP SLT skis (which I ran before). As I get older my shoulders and arms start to hurt after a long day, especially if you run into some twisty trails. Its a great ski for rock hard trails. Once the trails get loose the ski is a bit pushy but I'll take that over hard turning. 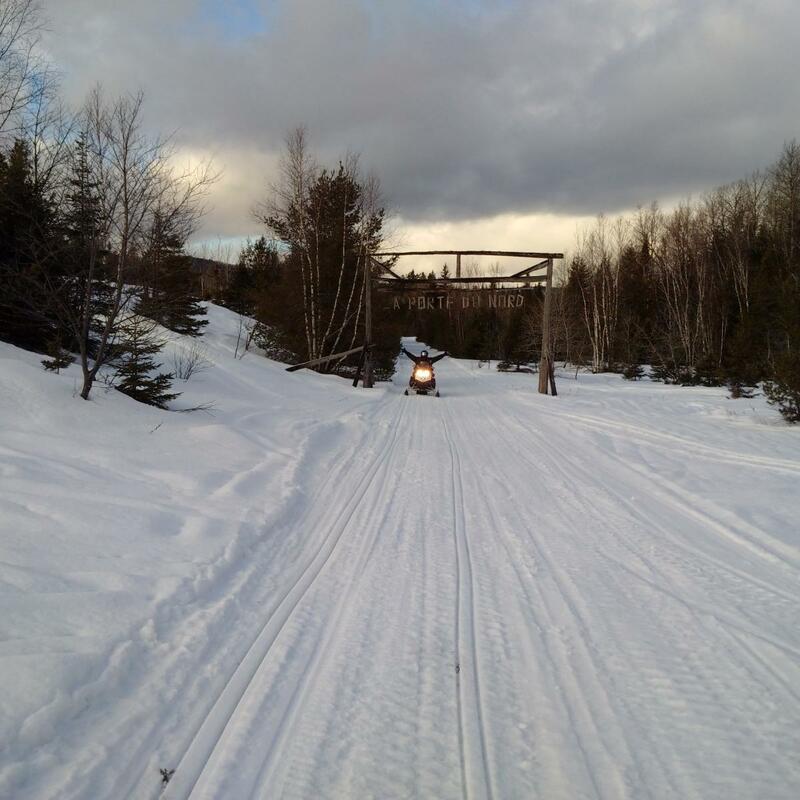 Some of my friends run Curve skis in Canada and if the trails are hard those skis are ridiculously hard to turn, but if the trails loosen up they are not too bad. I bought the Split Rails used on Craigslist for $350 complete with carbides, no way I'm paying $1000 for new. I wouldn't mind trying Snow Trackers on stock skis. I tried my buddies sled and it was very easy to steer, although I wonder how they are at high speeds. They seem like they could be too positive at high speeds. HELP!! I need input from experienced Quebec Riders! I'm from New Hampshire, and my riding has always been limited to that state. But with a "lack of winter" in NH this year, I need to go north to find snow. I've been planning to ride in Quebec over Easter weekend. But this will be my first time riding in Canada. 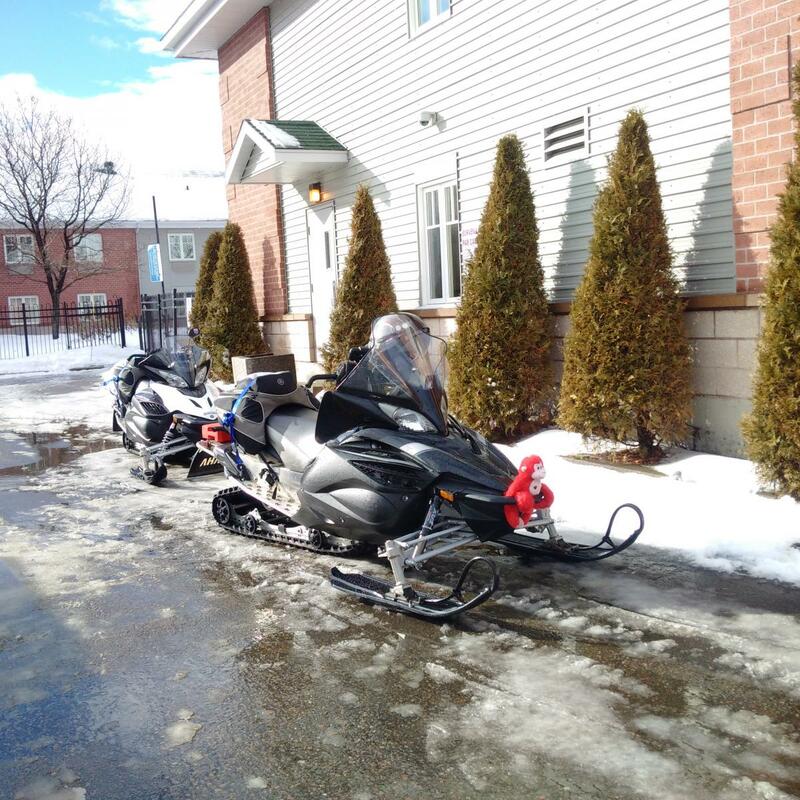 From my understanding, in a 'normal winter' riding out of Quebec City at the end of March is typically very do-able. But this year may be an exception. I currently live in Connecticut, so I really didn't want to drive any further North than Quebec City, as my starting point (if possible). It sounds like you guys are experienced Quebec riders, and have ridden there recently. I planned to stay at Four Points Sheraton Resort, they have a trail directly to RT#3. What do you think my chances are that the trails that far south will still be open Easter weekend? Some people I've spoken to say I'll need to go further north, to Saguenay/Mont Valin area, and stay in Chitoutimi. I'm putting it 'to the floor' for input. Any feedback will be very appreciated. Your best bet is to go in at Least Charlevoix, between Quebec City and the Saguenay. I told you to put those kids on eBay. Its all about priorities! Baie Saint Paul 1:15 North of Quebec City, I'm sure someone has been there recently and will chime in. Nice hotel on main drag and trail leaves from parking lot. Hotel Baie St Paul. Don't look at the drive as 7.5 vs 9.5 look at it as for ONLY 2 more hours of driving you would almost be guaranteed to be able to ride. Also since you state your desperate to ride that two hour difference will be well worth it. So you think there is any chance I can ride from Quebec City area? 50/50% chance? or worse? I've Heard Baie Saint Paul has good trail access. Seems like a lot of extra driving East when the goal is to get further north. But sounds like it may be my best option if not Quebec City. Am I correct in saying that there aren't any cities directly north (maybe 1/2 hour) of Quebec City where there are nice 'resort' style hotels, with pool for the kids? Even in Baie Saint Paul, where there are several hotels to choose from, it appears most properties are pretty basic, yes? I need to book somewhere that i can leave the wife and kids behind (at the pool etc) if they aren't interested in a second day of riding after the first day. What chance to you give it that it will be ride-able from Quebec? 50/50? worse? Or just stay here and take your chances. http://www.chateaumontsainteanne.com/en/ It's in Beaupre about 30 minutes Northeast of Quebec City. Pool, outside saunas, nice skiing if you want. I've stayed here many times with the wife and kids. Trail access from the hotel. Within 5-7 miles of the hotel your into the good stuff trail-wise. We've ridden dirt out of there before until you hit TQ3. It just goes up in elevation from there. I saw this, but didn't know there was trail access from the hotel. Very good to know! thank you for the recommendation - i'll definitely check this out! Le Manoir du Richelieu in La Mal Baie, nice hotel for the family and casino for the adults, indoor pool, outdoor saltwater pool, outdoor hot tub, sauna, gym and plenty of little boutiques. THEN HEAD FOR THE GREENS & YELLOWS!! Check the grooming reports before going out... Go to: http://fcmq.viaexplora.com/carte-motoneige/index.html Click "Services" in the upper right corner Click Delai de serfacage (and whatever other "Attraits" you want to see) Click "Fermer" to close the drop down box If you switch the view from Carte (map) to Satellite, youll see the Whites (those havent been done 3+ days) THEN HEAD FOR THE GREENS & YELLOWS!! Ok, you have all convinced me.... I've given up on Quebec City as an option. Snow probably won't hold out anyway. To Recap, I'm riding Driving up Thurs March 24, and riding Fri/Sat (25/26). Both are similar distance drives for me, so now I need to decide between the two. I have machine rentals lined up in both locations. I'm a very experienced rider, but I'll be riding with my wife and two young children. My wife has ridden/driven, but only for short distances. And my children are 7 & 9. So obviously each of us will take one. Any thoughts on which area is more 'family friendly'? But it looks pretty remote up there. Are there places on the trail to stop? Are both areas about the same? Very long distances between 'civilization'? I love 'remote' locations, but I need to weigh that against making this a successful family trip. In short, i want to give myself the best possible shot at my wife and kids having fun, so i can do it again. Any additional insight on this would be helpful. Yeah I second the Fairmont Richelieu if you're there with the family. Nice pool, ice skating (if it stays cold enough), could sleigh ride on the golf course I suppose. Day trip to Ravage is a must. Took the family there for lunch last year. Make sure you get the kids the hot chocolate, its excellent. The second your wife walks in there she will probably strip down naked and drag you into the nearest room. j/k. Its really nice but its a bit pricey. Yeah I second the Fairmont Richelieu if you're there with the family. Nice pool, ice skating (if it stays cold enough), could sleigh ride on the golf course I suppose. Day trip to Ravage is a must. Took the family there for lunch last year. Make sure you get the kids the hot chocolate, its excellent. The second your wife walks in there she will probably strip down naked and drag you into the nearest room. j/k. Its really nice but its a bit pricey. Snowmobiling never has been a sport for saving money!! It costs a lot......and it is worth every penny!! If it were a trip with 'the guys' I'd save money and just find a place by the trail with a roof and a bed. But I don't mind spending the money on a nice hotel to make the trip more appealing to the wife.